Our operation likes to keep the station operating positions seperated by hundreds of feet. In the past we typically used three single mode stations to alleviate the need for handling QSO dupe checking. However, the modern Field Day operation has site wide multi-station dupe checking with centralized and computerized logging to provide a competitive edge. LinkSys WRT54G Wireless 802.11b and 802.11g Routers (Pre revision 6) – Alternatively you can get the WRT54GL which is the Linux compatible LinkSys product that can still accept the DD-WRT firmware. MFJ-1800 2.4GHz WiFi dBi Yagi Antenna for 802.11b and 802.11g wireless networks. Includes camera tripod socket. This antenna looked pretty cheesy at first, but after using them for years, I find they work very well and are a solid, simple, useful design. HyperGain HG2409U Omnidirectional 2.4GHz Wireless LAN Antenna with 8.5 dBi. 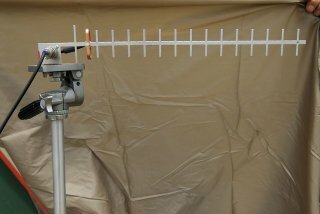 This sturdy antenna serves as the center point of the network with all remote yagi antennas pointing to it. The Blue boxes are the Linksys WRT54G routers running the DD-WRT firmware. The routers do not need the IP address unless you wish to access router statistics via the built-in web page feature of the DD-WRT operating system. Our transmitter stations were about as far apart as the rules allow so we used LinkSys WRT54G routers with the DD-WRT v23 software to “bridge” in the remote stations to one central unit which served as the site router. This made it easy to incorporate 2.4GHz antennas: omni on the router and those MFJ Yagi antennas on the bridges thanks to the external antenna connections. Laptops near enough to the omni router antenna needed no bridge and just connected via their internal wireless. Turn off 802.11 link speed autonegotiation in the DD-WRT admin settings. This will ensure the routers spend no time constantly trying to go “a little faster” resulting in short, but frequent network interruptions. These small interruptions cause N3FJP clients to lose connection to the FDNet.mdb file on the server resulting in the dreaded “unable to open database” error. Use the slowest 802.11 link speed for high network reliability. Resist the temptation to use the fastest 802.11 speed available. Yes it is true you can blaze away at 54 Mbps, if the link allows it, but the best 802.11 receiver sensitivity is available if you pick a slower speed. We used 1 Mbps on our seven computer network running N3FJP with no problems at all. Within 802.11b the WRT54 receiver sensitivity for 11 Mbps is from 7-10 dB worse than 1 Mbps; 1 Mbps, which is simple BPSK, is significantly more sensitive and there is little reason not to use it. If you decide to select 5.5 Mbps in 802.11b you might consider using 6 Mbps 802.11g instead; the OFDM may prove more tolerant of multi-path effects than the CCK modulation used for the higher 802.11b modes. Resist the temptation to use any kind of domain names, machine names, host names in your Field Day network. Use IP Addresses Only to keep your networking simple and straight forward. Put your N3FJP FDNet Server Computer on the router 802.11 unit. This is the one that should have an omni antenna. It is true any station logging computer can be the server and that’s fine. However, the idea here is to make the stations all clients so if their power systems screw up, the data is safely stored on the server. Also keeping the critical server computer away from the high RF environment of a station should help reliability. Whatever you do, do not connect two directional antennas to the two diversity ports of the Linksys WRT54G and point them in different directions. If you do this on your central router you will confuse local laptops with the wildly varying signal strengths. The best thing to do is leave one of those little antennas on one antenna port and cable up the after market antenna on the other port. Make sure the central Omni WAN Antenna is at least 10 feet high to get over the heads of folks or you will have outages. Use short, but dressable cables for the 2.4GHz signals and make sure it is the “good” stuff as ever dB matters. Make the cables long enough to allow for a trip free secure installation. Our central Omni antenna has 20 feet of LMR-400 “like” cable and works very well. Consider a server only tent to act as your “server room” where “IT” folks can debug in peace. Make a diode “oring” cable with a Gelcell and AC Power dongle for the Linksys routers so they stay up during generator refueling. If you don’t you might have to “re-browse” to the \\192.168.2.100\fd\fdlog.mdb file on the server computer. (We did not do this this year so we had to re-browse to the server sometimes and stop and start the FDNet program). Alternatively, a UPS on each router can work, but it may not be compatible with all generators. Befriend your IT guys and buy them a dinner as navigating through the amazing mess of the many different ways Windows does networking is a total pain in the rump. Of the many laptops we had there was zero consistency in how they behaved when accessing the share on the server computer. DD-WRT firmware for the LinkSys WRT54g router allows you to increase the power beyond Part 15 limits. If you exceed Part 15 power limits you are now transmitting as an Amateur Radio Operator. Obey Part 97 Identification and Power Limit Rules by putting your call-sign in the SSID of the routers and keeping the power under 100 watts (no, the Linksys cannot be set to 100 watts let alone 1 watt so you’re cool). Warning: if you raise the power in the LinkSys, it runs hotter; This could be a problem for commercial gear used outside on a hot day in June – use only the power you need. 2007-2011 were a terrific and efficient Field Day where we finally used the FDNet program (N1MM in 2011) the way it was intended to be used. 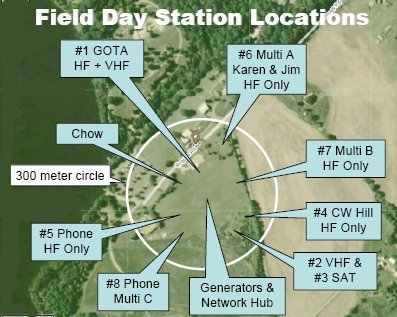 Our 3A was comprised of SSB, CW and for the first time a multi-mode station that could do SSB, CW and Digital. The multi-mode proved priceless and various operators came and went adding CW or Phone skills. Previously we kept this third station as a Digital only station, but this time it pulled its weight nicely. Having global band-mode dupe checking is priceless. The real-time QSO counts for CW, Digital and Phone ensured the competition between CW and Phone was kept lively. We had a VHF station too and its computer connected via normal wireless to the server “room” just feet away. A fellow came with a Satellite setup so we gave him an IP address and he was up and running on his internal wireless in no time. The ability to bring additional copies of FDNet into the master log this easily (despite the Windows Share difficulties) was just too cool. We had similar success in 2008 with a 4A deployment. Result? – We brought the highest score in many years if not ever! We look forward to 2009.